It's Walky! » My tushie used to have more padding. My tushie used to have more padding. The main reason I wanted to keep Joyce and Walky into folks-not-their-own-gender even though they themselves have been altered is that I wanted them to make up while they were swapped. I thought it’d be fun. It’s a good 70% why the story even exists. Probably. 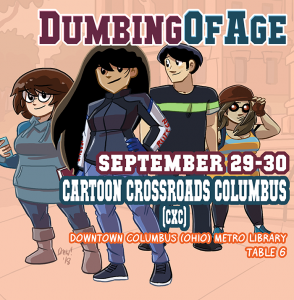 OH HEY next weekend, September 29-30, I’m going to be an exhibitor at Cartoon Crossroads Columbus (CXC), which is held in… Columbus (duh), Ohio (look there’s other Columbuses), at the downtown metro library! So if you want to come see me, I’ll be at table 6! I’ll have books and junk. It’s got some issues, but I can definitely see why this is a fan, and Maggie, favorite. Farewell, Tony. I didn’t actually like you that much, but still, tough lot. He’s not dead, he’s resting! The Norwegian Blue Tony prefers resting on it’s back! Your grav seems entirely appropriate here. If they still have access to the Martian resurrection tech they could bring Tony back again. The Cheese sealed off the resurrection chamber, and they never reverse engineered it. SEMME regained access – that’s how Mike is in Shortpacked. Eventually, yes, but right now it’s not an option. So sayeth Sad Tony. It’ll be okay, let’s make out on top of our comrade’s corpse. It’s not like he needs urgent medical attention or anything like that. We can rebuild him; we have the technology. The thing is it always gets worse for Tony every time they do that! I think this would have been even better if they hadn’t switched sexual preferences. Like, Walky is still into girls and (s)he is still kinda pissed at Joyce but Walky still loves Joyce and in times of trouble when (s)he needs someone to lean on it doesn’t matter that Joyce is a dude. I was honestly curious about the reason, I had been looking forward to finding out.